Cherry GmbH (formerly Cherry Corporation) (stylized as CHERRY) is a German computer peripheral-device maker. The company has its roots in the United States and is headquartered in Germany. It has additional offices in the United States, France, and China. They manufactured a large range of products including sensors, input devices and automotive modules until 2008, when Peter Cherry, the son of Walter L. Cherry, sold his company to ZF Friedrichshafen AG. Cherry was bought by ZF Friedrichshafen AG and renamed to ZF Electronics GmbH, the CHERRY naming was continued only for its computer input devices. Since the beginning of 2016 this product line has been operating independently on the market as the Cherry Group. After an eight-year partnership with ZF Friedrichshafen AG, Cherry (the computer input device manufacturer) was sold to GENUI Partners in October 2016. Cherry was founded by Walter Cherry in 1953 in the basement of a restaurant in Highland Park, Illinois, USA. With the passing of its founder, his son Peter took over the ownership of the organization. The company's headquarters were moved to Auerbach in der Oberpfalz, Germany in 1979. Cherry has manufactured keyboards since 1973, and claims to be the oldest keyboard manufacturer still in business. Cherry maintains production facilities in Europe (most notably in Bayreuth, Germany), Asia, and the Americas. All of its products are designed and developed at the company's headquarters in Auerbach in der Oberpfalz. It also has offices in the UK, Italy, France, Hong Kong, India, Mexico, Australia and other locations, with distributors in most major countries. In 2008, Cherry was bought by ZF Friedrichshafen AG and incorporated as the ZF Electronics GmbH Corporate Division. The Cherry brand continues to be used. 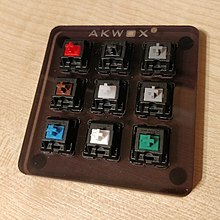 Among Cherry's widely known products are its line of MX and ML key switches that have been used in industrial electronics and point of sale environments since their inception in the 1980s, and more recently (~2008) by numerous manufacturers of consumer PC keyboards. Cherry MX Grey Switches can be found in Linear, Tactile, and Clicky variants. They are distinguished by stem color, with Linear being darker than Tactile. The Clicky version is no longer made. It is debated as to whether it even clicks, since it is not listed as a "click" switch by Cherry in their 1994 "Keymodule MX brochure", along with MX Whites, which are greased to reduce the click. Given their use primarily in large keys like Space Bar, the feel is selected to match that of the other keys on the board. In 2008, Cherry's production facility in Bayreuth received the Bayerischer Qualitätspreis 2008 award. At the end of 2006, Cherry received the Automotive Lean Production Award of the German economy magazine Automobil-Produktion. In 2005, Cherry GmbH in Auerbach received the Industrial Excellence Award as best European industrial facility. ^ a b "About us". CHERRY Americas. ^ a b "Locations". CHERRY Americas. ^ "GENUI Acquires ZF Subsidiary Cherry". ZF Friedrichshafen AG. Retrieved 2018-08-28. ^ "Cherry MX". Deskthority wiki. 2013-09-06. Retrieved 2013-09-11. ^ "Cherry MX Click Grey". Deskthority wiki. Retrieved October 22, 2017. ^ Kowaliski, Cyril (March 7, 2013). "A first look at Cherry's MX green key switches: Eat your heart out, buckling springs". The Tech Report. Retrieved October 22, 2017. In both feel and specifications, though, the greens are closer to the buckling spring switches of IBM's iconic Model M keyboards. That makes them uniquely appealing to old-school geeks. ^ "Cherry MX". Deskthority wiki. October 9, 2017. Retrieved October 22, 2017. 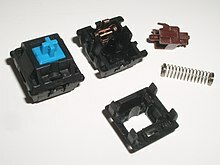 Cherry MX is the most popular line of keyswitches used in mechanical computer keyboards.